Lucas Punkari/Daily Herald Martin Ring poses with the Bob Hemsworth Trophy after winning the 31st annual Senior Men’s Northern Championship Wednesday at the Cooke Municipal Golf Course. Martin Ring’s been one of the top golfers in Prince Albert for many years. Now he’s batting 1.000 in the senior men’s tournament on his home course. 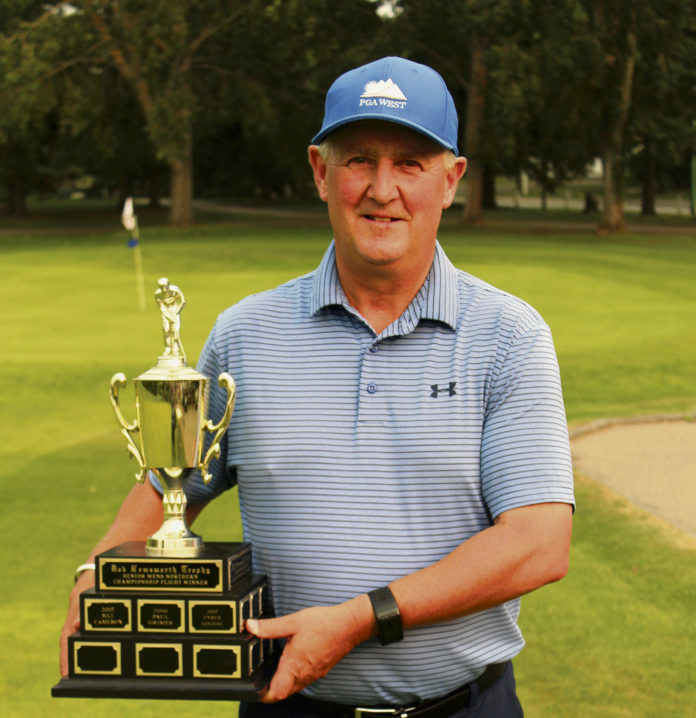 The 55-year-old led the way from the start at the 31st Senior Men’s Northern Championship at the Cooke Municipal Golf Course this week, as he won the Championship Flight by two strokes over Bruce Ede Wednesday. “It’s one of the first time that I’ve been in the field for a tournament and they are calling me a kid,” Ring joked. Ring, who won the Men’s Northern title in 2009, jumped out into the lead with a round of 68 Tuesday and kept his strong play into the final round. “I felt comfortable right from the start and it really seemed like I was in control of everything, other than a double bogey I had on the 12th hole,” Ring said. Ring solidified his lead with a pair of birdies on the 14th and 15th holes, which proved to be pivotal as he finished off his round of 71 with a double bogey. “That was a little frustrating and a bit of a disappointment to have that happen on the 18th, as I was looking at a chance to have a second straight round in the 60’s,” Ring said. The 2018 season has been a solid one for Ring, as he reached the semifinal of the Men’s Northern and the Men’s Lobstick tournament at the Waskesiu Golf Course. 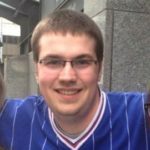 “I also competed in the Senior Men’s Lobstick for the first time and got a top 10 there, so I can’t complain with how things have gone,” Ring said. Senior Men’s Northern Championship chairperson John Toner presents Jim Scissons with the super senior championship trophy following the final round of play at the Cooke Municipal Golf Course Wendesday. 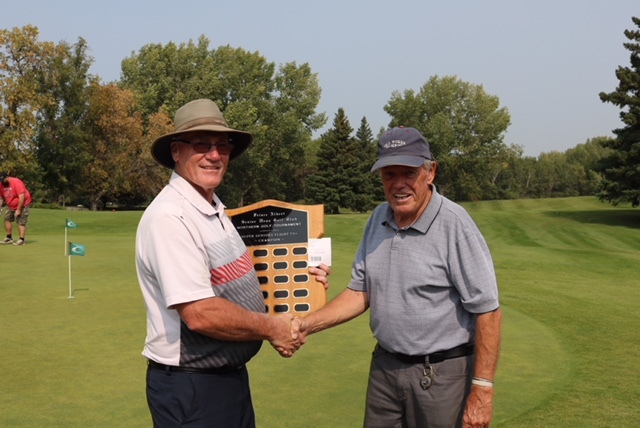 Meanwhile, Jim Scissons of Saskatoon won the super senior championship flight with a score of 149, which was 10 strokes better than John Batiuk.